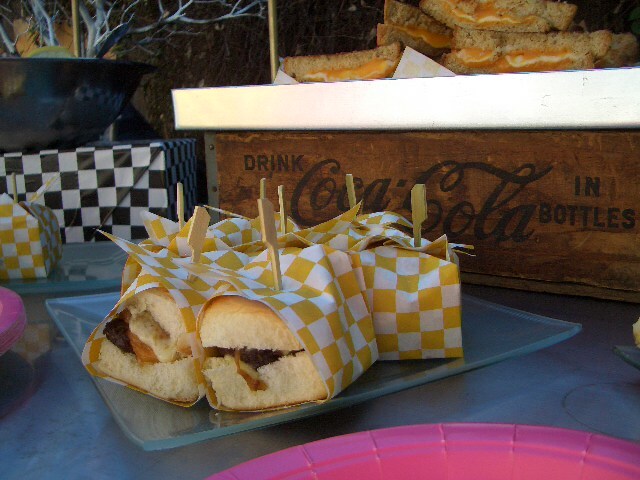 Spanglish Eats catered Aven’s 1st birthday party yesterday for over 30 family and friends dressed for the 50s diner theme. Chef Javier put together a yummy, classic American menu to compliment the design including cheddar cheese sliders with caramelized onions, grilled Gruyere and cheddar cheese sandwiches, fresh cut potato chips seasoned with pink salt and herbs, and winter slaw with radicchio and light lime aioli dressing. Try not to bite the screen looking at the pictures below! Previous PostA star is born!Next PostComing soon to a Farmers Market near you!